Include nail care clippers. Plastic file. 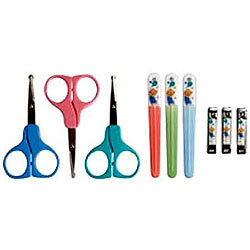 Curved tip scissor. Handles baby soft skin. Properly sized with babys small nails in mind but are easy for an adult to use. Complete set to look after baby"s tips and toes.